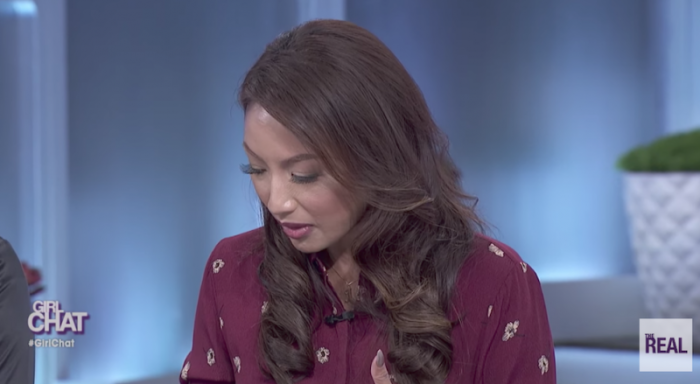 Jeannie Mai is opening up about her divorce from Freddy Harteis after more than a decade of marriage, insisting there was no cheating or betrayal involved. After 13 years of being together Mai, 38, had nothing but nice things to say about Harteis. "To this day, I swear, he's the best man I know," she said Monday on "The Real," where she serves as a co-host. "I married him because he's like my dad; very loyal, very compassionate, so funny ... an awesome guy. In our 13 years of being together there were never any lies, no betrayal, no cheating, nothing." Mai thanked her co-hosts on "The Real" along with the show's fans for always supporting her. "So I want to say to you ladies, you guys have known from season one, I'm always honest about things we struggle through. I was real, sometimes too real for everyone to have an opinion," she said. "But it took us time. You guys are so supportive and I love our Real fam and friends out there who know that it's not about taking sides, it's about loving what you go through." News of Mai's divorce came last Friday when Us Weekly reported that the couple's representatives said they are "amicably divorcing." While it is unclear what led to the divorce, Mai has been transparent about issues within her marriage for some time. She previously admitted that while the pair initially agreed that they would not have children since Mai didn't want any, her husband's views began to change. "I guess it's just really hard because I can't just have a child for another person, and you don't have a child to save your marriage, but we are in love, and we are enjoying life, and he's my Freddy, and I'm his Jeannie, and we don't have any other problems except that, which, you never know what could happen in the future," she previously said on "The Real." "So right now we are clinging to each other, and we're waiting for God to kind of tell us what that means, and it's kind of weird to go to sleep every single night holding on to that person you love so much, not knowing where it's gonna go."